The Sovereign™ XLS features 600 sq. in. primary cooking surface and includes 4 stainless steel Dual-Tube™ burners, solid stainless steel 9 mm rod cooking grids, stainless steel Flav-R-Wave™ cooking system, and electronic ignition. The XLS series features stainless steel drop down side shelves and fully enclosed cabinet base. 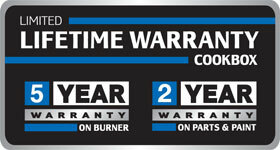 Warranty: Limited Lifetime on casting, 5 years on burner, 2 years on all other parts.